Post by Dr. James Ervin, Compliance Manager for the San Jose-Santa Clara Regional Wastewater Facility I joined UC Davis / Dr. Jim Hobbs fish monitoring survey on October 1st. I was on the Saturday run this time. 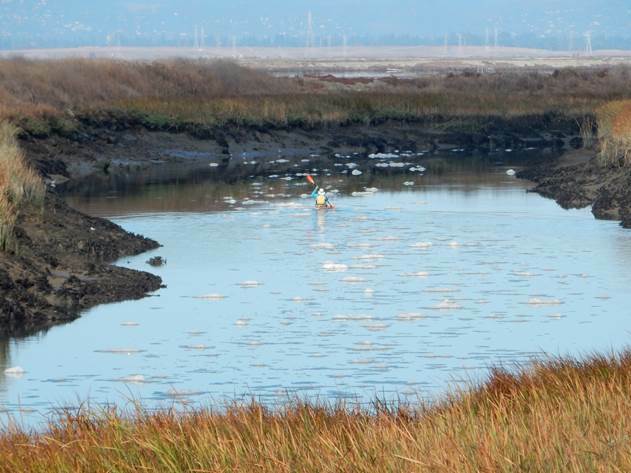 As explained last month, monthly trawls are performed in Alviso Slough and Bay-side stations on Saturdays. On Sundays of the same weekend, the crew trawls the upstream half of Lower Coyote Creek. Saturday runs are always good for variety. The fish are fewer, but get bigger and weirder as you venture deeper into the Bay. On this day, we launched from the public boat ramp at Alviso. This is what Alviso Slough looked like early in the morning. Can you see the gobs of white foam? Many people assume foam like this must be from detergent or some other form of pollution. Foam like this is quite common in sloughs of Lower South Bay. This is a result of billions of microbes cycling carbon. The microbes synthesize and lyse triglycerides, amino acids, proteins, etc. as they grow and die. This material becomes dissolved organic carbon (DOC) in the water column. The least bit of turbulence as Bay tide rushes in and out builds up globs of waxy foam that can persist for hours. by Alessandra Bergamin on April 17, 2014 It is early morning at Eden Landing Ecological Reserve and in a pond designated as E9 by the managers of the South Bay Salt Pond Restoration Project, the water is cold and still. A leopard shark, around three feet long with distinct black and brown bands and spots mottled across a steel-gray body, rests on the pond’s silty floor. There is no real agenda for the day except, of course, to eat, but for one of the largest predators in the San Francisco Bay that shouldn’t be too much of a challenge. So the shark can afford to wait for the water to warm and the tide to come in before it starts its day.